A hydrophilic molecule or substance is attracted to water. Water is a polar molecule that acts as a solvent, dissolving other polar and hydrophilic substances. In biology, many substances are hydrophilic, which allows them to be dispersed throughout a cell or organism. All cells use water as a solvent that creates the solution known as cytosol. Cytosol contains many substances, most of which are hydrophilic on at least part of the molecule. This ensures that that can be transported about the cell easily. Substances that are hydrophobic, or repel water, are often transported through and between cells with hydrophilic proteins or structures attached to aid in their dispersal. Hydrophilic substances diffuse in water, which is to say they move from areas of high concentration to areas of low concentration. This is caused by the attraction of water molecules to the hydrophilic molecules. In areas of high concentration of the molecules, water moves in and pulls the molecules apart. The molecules are then distributed to areas of low concentration, where more water molecules can interact. Diffusion is a very important property of most hydrophilic substances to living organisms. Diffusion allows them to distribute substances with little to no energy on their part. Sugar, or more specifically glucose, is a molecule that many types of cells use as an energy source. A molecule of glucose has both hydrophobic and hydrophilic portions. 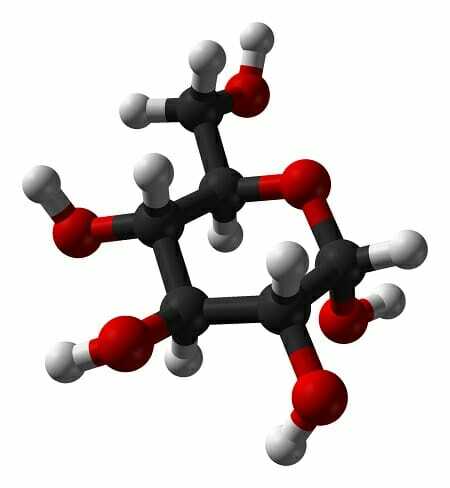 The picture below shows a molecule of glucose. The black balls are carbon atoms, the red balls are oxygen atoms, and the white balls are hydrogen atoms. Bonds between carbon atoms share electrons equally, and no static electrical charge is created. The oxygen atoms, however, pull an unequal share of electrons from the carbon and hydrogen atoms they are attached to. This property, known as electronegativity, results in the electrons being distributed unevenly, a majority of the time. This causes an electric dipole to form across the bond, creating areas of positive and negative energy. Water can interact with these dipoles, and dissolve glucose. In the human body, as in many animals, the energy stored in the bonds of glucose is used in every cell to drive cellular functions. To transport glucose to the many cells, glucose dissolved in the gut and stored in the liver is released into the bloodstream. Because glucose is a partially hydrophilic molecule, it dissolves equally into the bloodstream and provides glucose to all parts of the body. To get through the hydrophobic centers of plasma membranes, glucose is transported by special proteins. Once in each cell, glucose can be broken down through glycolysis and respiration to provide the coenzyme ATP. ATP can provide energy to other enzymes to help them perform their various functions. DNA, the information molecule that drives life on Earth, codes for a sequence of amino acids. These amino acids can be hydrophilic or hydrophobic. Proteins are created by sequences of amino acids, but do not become functional until they are properly folded. A long string of amino acids becomes folded because of the various interactions it has with the other amino acids in the chain, as well as interactions with the environment. Eventually, the hydrophobic and nonpolar regions of the protein will become clustered together and the hydrophilic polar regions will be exposed to the environment. Proteins become functional enzymes when they are the right shape to accept a substrate and lower the activation energy of a chemical reaction. If a mutation in the DNA places a hydrophobic amino acid where a hydrophilic amino acid should have gone, the whole structure can suffer and the enzyme may no longer function. Since water is the solvent in all cell cytosol, it is important that the outside of proteins be hydrophilic, so they can be dispersed and moved around the cell. Thus, a cell can create proteins in one place (usually the ribosomes), and have them distributed through the cell by diffusion. This hydrophilic property of most proteins allows them to fill certain cells, and produce a huge amount of certain products necessary for the body. Cell membranes are created from two sheets of molecules known as phospholipids. Phospholipids are amphiphilic, meaning they are both attracted to water in one region of the molecule, and repel water in other regions. The head of the phospholipid molecule is the hydrophilic region. The tails are the hydrophobic region, and point inward, toward each other. This excludes water from the middle of the two sheets, thus creating a divider between two reservoirs of solution. If the membrane is closed, in a sphere, a cell is created. Bacterial cells have no further division, but eukaryotes further divide their cells into organelles. These organelles are also surrounded by phospholipids. Although water cannot easily pass through the cell membrane, there are many embedded proteins that allow water into the cell. There are also proteins that transport other hydrophilic substances across the membrane. These proteins, while not enzymes, are also formed by amino acid chains. As seen in the graphic below, these proteins often function by using the energy from ATP to move various substances across the membrane. Without a channel through the hydrophobic membrane, the hydrophilic substances could not pass. The protein in the above graphic has both hydrophobic and hydrophilic portions. The exterior of the protein, the parts exposed to the environment and the cytoplasm, will be hydrophilic. The interior parts of the protein that interact with the lipids in the middle of the membrane, will be hydrophilic. This way, the protein can stay embedded in the membrane simply through the tendency of hydrophobic substances to cluster and hydrophilic substances to attract to water. The ends are pulled toward the water, and the middle interacts with the hydrophobic lipids. Many macromolecules are amphiphilic in this way, to interact with various substances. Hydrophobic – Molecules or substances that are not attracted to water, or repel it. Polar – Molecules that have opposing electrical poles. Nonpolar – Molecules that distribute electrons evenly, causing no interaction with polar molecules. Amphiphilic – Is attracted to both water and hydrophobic substances, like soap. 1. Researchers often design medicines that can be swallowed, digested, and diffused into the bloodstream. What property to these medicines have? A is correct. This would be an example of a hydrophilic medicine. Because it can be dissolved into the bloodstream, it is hydrophilic. Molecules that need special proteins or transport vesicles to be carried in the blood are usually hydrophobic. The medicine is most likely a polar molecule, because it can be dissolved by water easily. 2. When cooking a meal, a chef puts lots of salt on freshly cut potatoes. The salt draws the water out of the potatoes, due to the strong attraction between the ion molecules of salt and the polar regions of the water molecules. What is salt? A is correct. Salt is a matrix of positively and negatively charged atoms. These ions are attracted to the polar regions of H2¬O, and are pulled apart by it. As the water begins to be pulled out of the potato, the salt begins to dissolve, and more surface area is exposed. Once water has been pulled from all the surface cells, it will begin to move outward from the center of the potato. If salt were hydrophobic, it would not attract the water from the cells. 3. A protein is being made that will be embedded into the cell membrane. The protein functions in recognizing other cells. As such, sticks out of the cell membrane into the environment. However, the protein does not transmit anything to the inside of the cell. Therefore, it does not extend past the middle of the cell membrane. The portion of the protein in the environment is Part A, the part of the protein embedded in the membrane is Part B. What property does each part display? C is correct. This protein is amphiphilic, in that it has both hydrophilic and hydrophobic portions. The hydrophilic portions can interact with the environment, while the hydrophobic portions keep the protein firmly embedded into the lipid layer of the cell membrane. Oftentimes, proteins such as this will interact with other proteins in the membrane to pass cellular signals to the internal portion of the cell, and pass messages back out.